Welcome to another episode of “Sandy loves Jamie”. 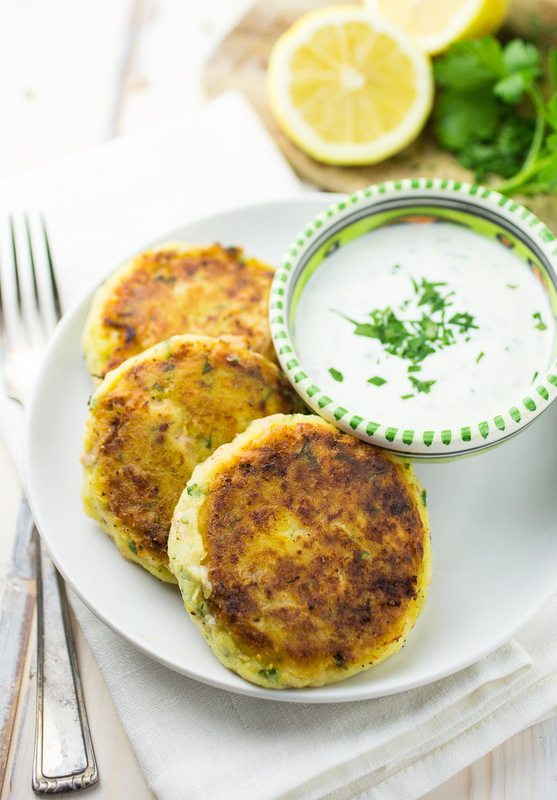 This week it’s Salmon fishcakes with a fresh lemon yoghurt dip and yes, it is once again adapted from Jamie Oliver. I’ve been slightly obsessed with his newest tv show “Friday Night Feasts” lately. I actually think it’s one of his best. He did the quick meal thing, the healthy meal thing and the cheap meal thing for years now, so it was time for a show like “Friday Night Feasts”, because those dishes are neither of the above, but that’s what makes them so decadent and delicous and just perfect for the weekend. If you haven’t caught this show, give it a try. It’s foodporn at its best. Plus you get some amazing DIY food hacks, like building your own low budget bbq smoker. 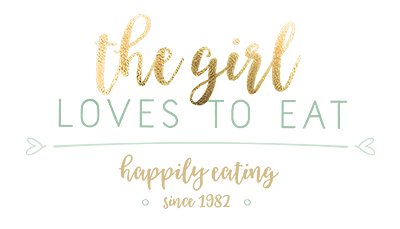 However this recipe here is not from that show, it’s an oldie but goodie. I’ve been making this recipe for years now and it’s always been a big success with everyone who tried it. The salmon stays deliciously juicy because you just steam it and if you fry the fishcakes properly you get this nice crispy outside… this together with the tangy lemon garlic dip makes a great dish. 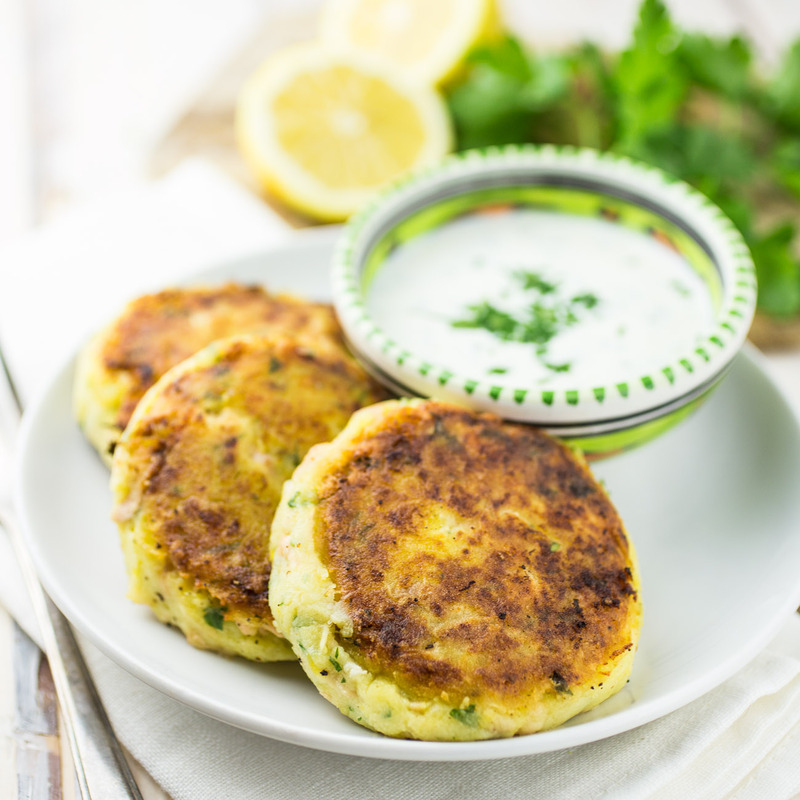 I always make a huge batch of those fishcakes and whatever we don’t eat, tastes great cold the next day (if there’s something leftover…. big IF there….). 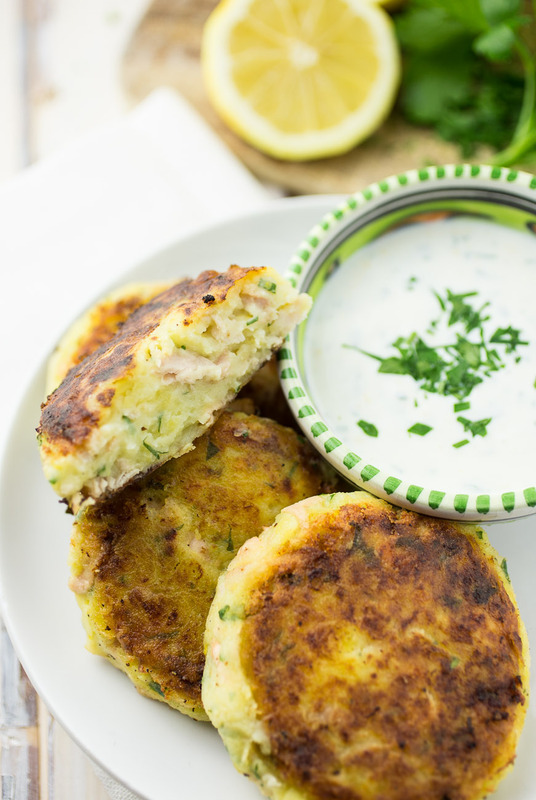 Crispy fishcakes filled with tender salmon, paired with a tangy yoghurt dip. Peel the potatoes, cut them into 5cm wide chunks and place them in a high pot covered in water. Add 1 tsp of salt and put on medium to medium high heat. Put a colander over the pot. When the potatoes start cooking, place the salmon filets into the colander and cover it with aluminum foil, so the steam won't escape. Steam the salmon for 5-8 minutes. Take out and set aside. Cook the potatoes until they are soft, around 20-25 minutes. Drain and mash them while still hot. Set aside to cool for 10-15 minutes. 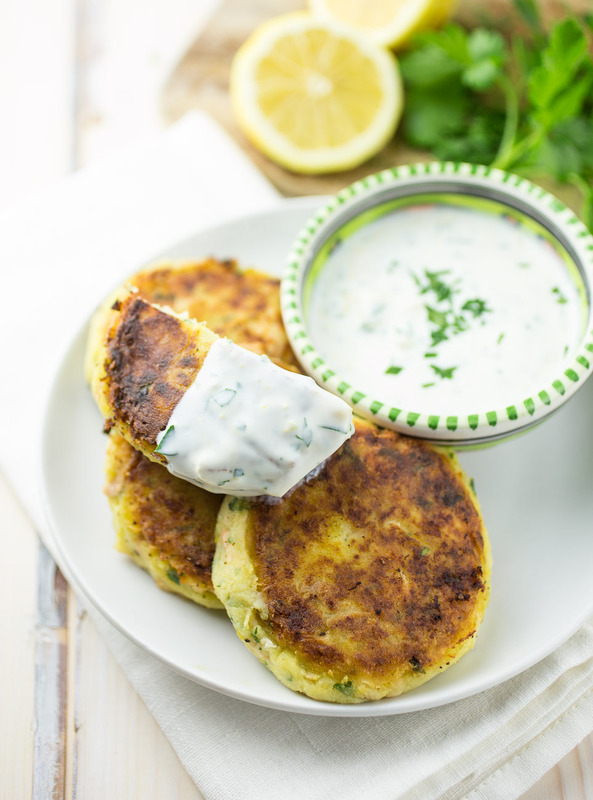 Meanwhile make the dip by mixing yoghurt, garlic, parsley and zest and juice of one lemon together. Season with salt and pepper. Set aside. Add the juice and zest of two lemons, the parsley, the egg, the flour and salt and pepper to taste to the potatoes. Gently break the steamed salmon into chunks and add as well. Mix everything. Heat a large frying pan with 3 tbsp of olive oil over medium high heat. 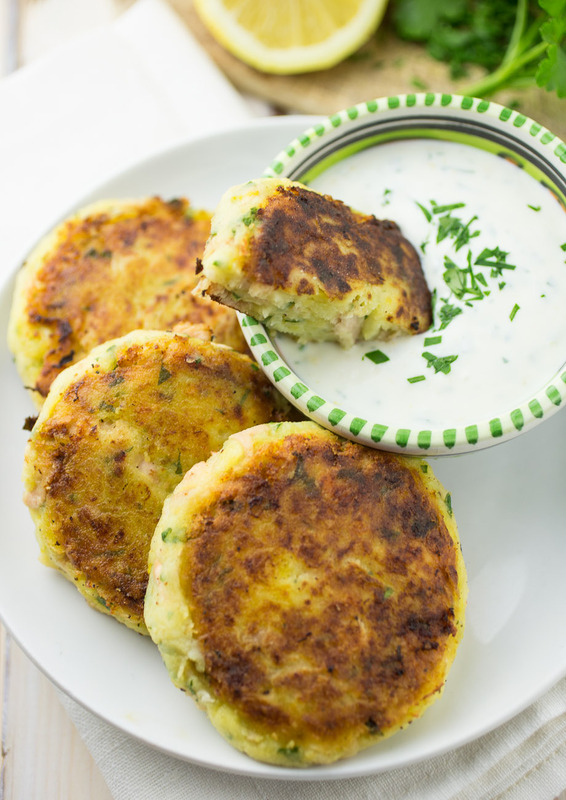 Form the fishcakes and carefully dust them with flour. Fry them in batches until they are golden brown and crispy on each side. I found that forming the fishcakes is easiest if you wet your hands with some water first. That way the potato mixture won't stick to them.